Plymouth District Attorney Timothy Cruz says 47-year-old Allen Warner was taken into custody Tuesday afternoon following an incident at a Dunkin' Donuts. Cruz said police had responded to the Dunkin' Donuts for a hit-and-run and after reviewing surveillance video they saw the suspect vehicle was a flatbed tow truck belonging to T&K Asphalt Services in Whitman. Authorities went to the company and found out that the truck had been stolen. At that exact moment, Warner drove by in the truck. Police were able to pull him over and take him into custody. "He was driving by T&K and the officer was conducting an investigation to see who the operator of the vehicle was without the knowledge or the fact it was taken away from T&K when the vehicle stopped by and Officer Poirier stopped the vehicle," Cruz said. Shortly after the arrest, police in Marshfield tweeted, "Thanks to everyone for your vigilance, patience and cooperation." Cruz said Warner is being charged with murder. Authorities said they recovered the gray Corolla he had been driving but not the gun he allegedly used to shoot his wife, Shana Warner, to death. Warner was considered armed and dangerous after he brutally attacked his estranged wife just before 6 p.m. Monday, police said. Authorities had previously said the victim called 911 to report that her estranged husband was chasing her in a vehicle. Responding officers found Shana Warner with injuries to her face, according to Cruz. She was rushed to South Shore Hospital, where she died. Cruz said it appeared Shana Warner was shot, but also "sustained other life-threatening injuries," and that they were waiting for the medical examiner's report. He also said it was unclear if Shana Warner had called 911 to say Allen Warner was chasing her before or after she had been shot. 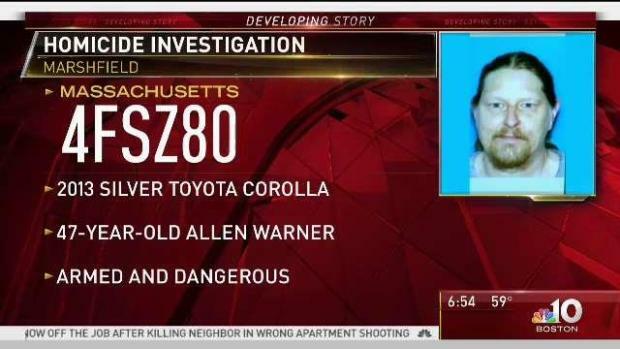 Forty-seven-year-old Allen Warner, suspected of killing his estranged wife Monday evening, is in police custody in Whitman, Massachusetts, according to police in Duxbury. Tom DeFlippo, Shana's father, told NBC10 Boston he is devastated over the loss of his daughter. "We are best friends... we argue sometimes, as usual, but we are always best friends," he said. The two worked side-by-side in the family landscaping business for the past 15 years. "The first time she said 'I want to be a landscaper' I thought she wouldn't last a week and she fooled me," DeFlippo said. He said very little about his estranged son-in-law, except that he never had any reason to believe he was violent toward his daughter. Warner's neighbor and property manager, Joe Burton, said he saw him Monday morning and was shocked to hear what happened. A massive manhunt for a Massachusetts man suspected of killing his estranged wife continued for a second day on Tuesday. "It's unlike him to do something like that. I would never think of him doing something like that," Burton said. Marshfield Police Chief Phil Tavares called the incident "another despicable, cowardly act of domestic violence," adding that Allen Warner is "well-known" to authorities. "Over a number of years, he's had numerous interactions with police," said Tavares. The last time she filed for divorce was in May of 2018, according to court documents. Police in Marshfield said they got a call about Warner being in the area five days ago, saying he looked suspicious. 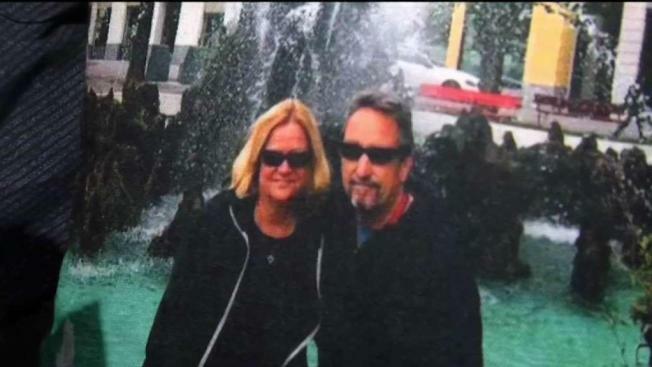 Manhunt Underway for Shooting Suspect in Marshfield, Massachusetts police are searching for a man believed to be a person of interest in the shooting death of his estranged wife. "We believe he came to Marshfield specifically for her. He'd been stalking around the area days before to locate her," said Tavares. Warner is scheduled to be arraigned Wednesday in Plymouth District Court. It's unclear what other charges besides murder he may be facing or if he has an attorney.